Moist. Floodplain woods, river terrace, northwest and northeast facing slopes. This erect perennial is found as colonies of 1 or 2 up to 500 plants. The plant rises from a short, vertical, thickened, underground stem (corm). Almost all of the plants in a colony will flower each year. Most plants are two-leaved and produce flowers. Non-flowering plants have one leaf. The leaves appear to originate at the base, but they actually originate below ground, about halfway up the underground stem. They are arranged in pairs but are not exactly opposite. They are 1½″ to 5″ long, lance-shaped, untoothed, fleshy, green, flat, mottled or spotted with silver, and covered with a whitish, waxy coating. The inflorescence is a solitary flower hanging downward at the end of a stout, nodding stem. The stem is 1½″ to 4¾″ tall, hairless and leafless. The flower is dime-size or smaller and has 4 to 6 tepals, usually 5. The tepals are ⅓″ to ⅔″ long, lance-shaped, and white or pinkish-white. They flare outward, extending nearly to the horizontal, eventually curving backward. The anthers are yellow. The plant reproduces vegetatively from a single creeping stem on fertile plants that roots at the nodes sending up new plants (stolons). Fruits are rarely produced. When they are it may be the result of hybridization with white trout lily. They are small and nodding, not erect. 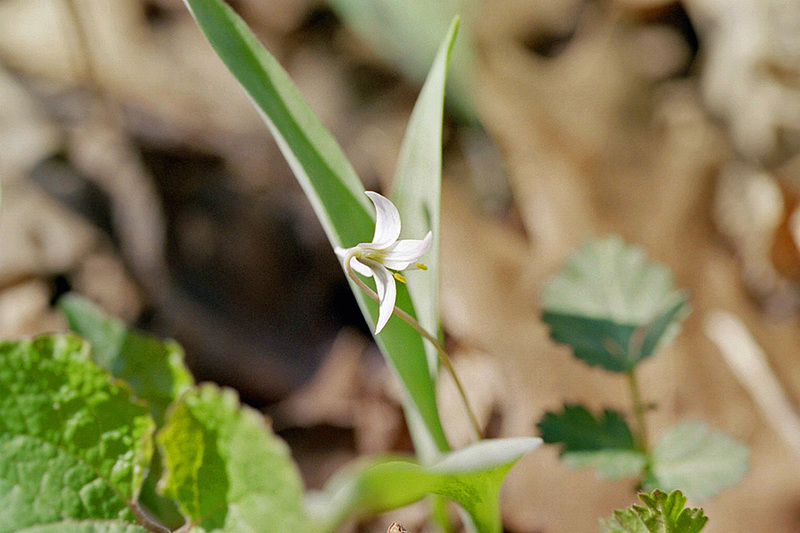 White trout lily (Erythronium albidum) is sympatric with Minnesota dwarf trout lily. Where the two species occur together non-blooming plants are indistinguishable. However, less than 1% of the plants in a colony will flower in any given year. Therefore, if a carpet on one-leaved non-flowering plants are seen they may be white trout lily but cannot be Minnesota dwarf trout lily. 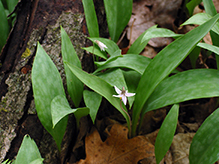 white trout lily is a larger plant. The leaves are 3″ to 8½″ long. The flowering stem is 4″ to 6″ long. The flower always has 6 tepals. The tepals are 1″ to 2″ long and white or bluish-white with yellow near the base. Sources: 2, 3, 4, 5, 6, 7, 23, 28. The map at left includes two sightings outside this species’ native range, one at the Eloise Butler Wildflower Garden in Wirth Park (Hennepin County), and the other at the University of Minnesota Landscape Arboretum in Chanhassen (Carver County). It also includes an occurrence reported by the U.S. Fish & Wildlife Service County Distribution of Federally-Listed Threatened, Endangered, Proposed, and Candidate Species (Dodge County); and an occurrence reported to The Biota of North America Program (Fillmore County). This is a spring ephemeral. All of the parts of the plant that are above ground will have disappeared by the time the forest canopy has developed in June. Look for it mainly on lower parts of north-facing slopes that rise 40–80 feet above streams or abandoned stream channels. It can occasionally be found on northwest and northeast facing slopes. Minnesota dwarf trout lily is endemic to Goodhue and Rice Counties in Minnesota, hence the name. It is also found in Steele County. It occurs only at elevations of 960 to 1,000 feet above sea level. The major populations are found on the slopes of the Canon and Straight Rivers near Faribault. Smaller populations occur along the Little Cannon River, Zumbro River, North Fork Zumbro River, and Prairie Creek watersheds. 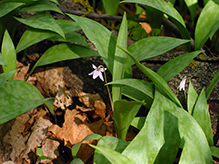 Some of the public places this plant can be found are Nerstrand-Big Woods State Park; Clinton Falls Dwarf Trout Lily SNA; Cannon River Trout Lily SNA; North Fork Zumbro Woods SNA; Prairie Creek Woods SNA; Eloise Butler Wildflower Garden in Wirth Park, Minneapolis; River Bend Nature Center in Faribault; and the University of Minnesota Landscape Arboretum in Chanhassen. In Nerstrand-Big Woods State Park look for it along the boardwalk on the Hidden Falls Trail and along the north-facing slopes of Prairie Creek. Referring to closely related species that have ranges that overlap but which do not interbreed. Rare and endangered species blooming! It only grows in less than 600 acres and appears for fewer than three weeks each year. 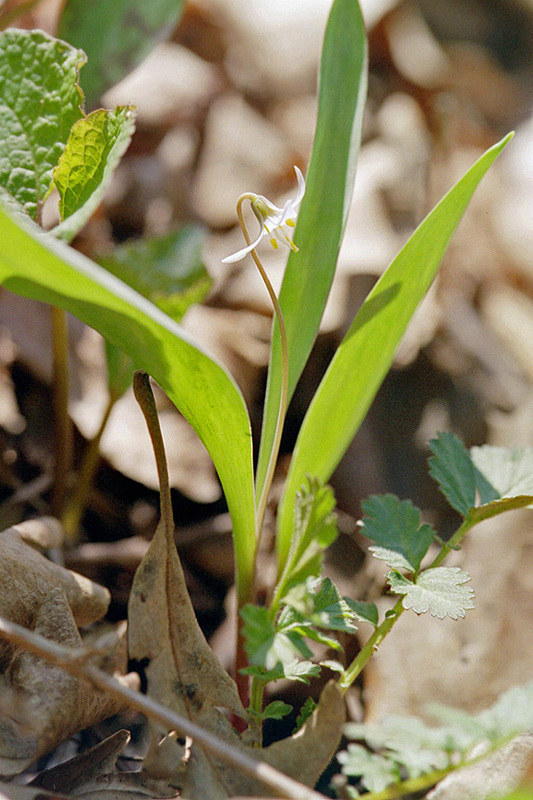 The Dwarf Trout Lily is an endangered species that only grows in a small area of Minnesota and no where else in the entire world.